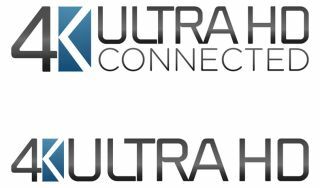 CEA unveils logos for Ultra HD 4K-capable tech products | What Hi-Fi? New logos that have been designed to help consumers find out if a TV or projector is able to support Ultra HD 4K content have been unveiled by the Consumer Electronics Association (CEA). The logos will appear on products that meet the CEA's "voluntary core characteristics" for 4K and will be made available to manufacturers to use on packaging, marketing materials and more. 4K Ultra HD and 4K Ultra HD Connected are the two logos and correspond with those characteristics announced earlier this year, dealing with picture quality and aspect ratio among others. In addition to the new logos, the CEA has confirmed that its Video Division Board has backed the use of "4K Ultra HD" as the term applied to products that offer more than eight-million pixels. CEA president and CEO Gary Shapiro said: "The new logos mark another important milestone as the inevitable evolution to 4K Ultra HD continues." A licensing agreement for manufacturers who opt to use the new logos in the promotion of their Ultra HD 4K tech products is now being drawn up by the CEA.